KidCheck, providers of secure children’s check-in software, is pleased to announce it is partnering with the International Network of Children’s Ministry (INCM) to offer a free webinar, titled “Improving Child Safety in Your Children’s Ministry,” to provide insight on the leading concerns around child safety issues confronting churches today. More about KidCheck can be found at http://www.kidcheck.com. The safety and security insights from this webinar can help churches create a safe environment for the children in their care and minimize any possible safety and security issues. KidCheck, providers of secure children’s check-in software, is pleased to announce it is partnering with the International Network of Children’s Ministry (INCM) to offer a free webinar, titled “Improving Child Safety in Your Children’s Ministry.” The webinar is hosted by INCM and will be held on April 6, 2016, at 12:00 noon Central Time. The webinar is designed to provide insight on the leading concerns around child safety issues confronting churches today. The reality facing churches in regards to child protection can be challenging. The “Improving Child Safety in Your Children’s Ministry” webinar provides a practical training tool to share actionable, specific best practices that can be implemented to make an immediate impact on child protection and increase child safety. This INCM webinar features Alex Smith, CEO of KidCheck, and Angela Lewton, KidCheck’s child safety expert and Facilitator for Darkness to Light. Webinar topics will include: creating and implementing security teams, emergency scenario planning, volunteer and staff security tips, predator identification, facility security, and more. Learn more and register to attend INCM’s free “Improving Child Safety in Your Children’s Ministry” webinar. KidCheck, Inc. provides secure children’s check-in software and complete check-in station systems for churches, fitness facilities, and organizations caring for children. KidCheck believes every child deserves a chance to grow in a safe environment, and every parent deserves peace-of-mind about the safety of their children. KidCheck is committed to delivering easy-to-use, innovative, and reliable check-in systems backed by world class support. 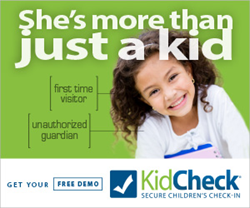 To learn more or to request a demo visit http://www.kidcheck.com.